I have an external screen plugged into my MacBook. For some reason when I went to use iTunes today, it was positioned with the top of the window up off the top of my external screen. I couldn’t access the control buttons, but I also couldn’t grab the TitleBar and reposition iTunes to be 100% on my screen. What to do? In the case of iTunes the fix was easy. The Zoom option in the Window menu brought iTunes back down within the perimeters of the screen, so that I could again access the TitleBar and drag it around. But some apps may not have a Zoom menu option. What then? Here’s a few easy fixes. The simplest way is to drag the left or right edge of the unruly window in toward the centre, whilst holding down the Shift key. This will cause the top and bottom of the window to shrink inward also. The TitleBar should easily become accessible this way. The Three-Finger-Drag: If there is even a smidgen of the app’s ToolBar showing, you can use the three-finger-drag. You may need to enable this in System Preferences > TrackPad.Now, position the pointer so that it’s over the ToolBar, which is possible even if just its very edge is accessible. 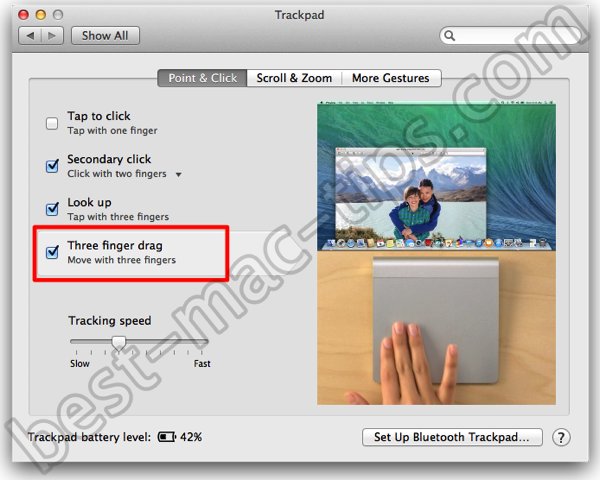 Then use three fingers on the trackpad to move tame that window. Something else that’s handy for a great deal more is BetterTouchTool. It has preferences that modify window behaviour. In BetterTouchTool bring up its Preferences. 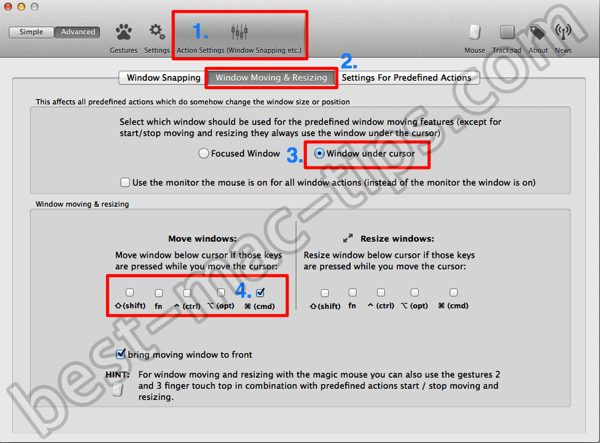 Then activate the Action Settings panel, select Window under cursor, then select one of the Move windows: option that suit you. The following screenshot numbers and indicates each step. This solution is really not necessary unless you wish to make use of BetterTouchTool. I use it, and find it to have many time saving features. Being able to reposition a window by simply holding down a key and moving the mouse is just one handy feature.